It takes approximately 30 days to obtain a new block from the Pooling Administration, and more than that to open a new code. 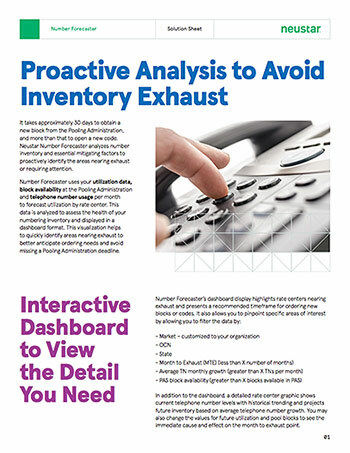 Neustar Number Forecaster analyzes number inventory and essential mitigating factors to proactively identify the areas nearing exhaust or requiring attention. Number Forecaster uses your utilization data, block availability at the Pooling Administration and telephone number usage per month to forecast utilization by rate center. This data is analyzed to assess the health of your numbering inventory and displayed in a dashboard format. This visualization helps to quickly identify areas nearing exhaust to better anticipate ordering needs and avoid missing a Pooling Administration deadline. In addition to the dashboard, a detailed rate center graphic shows current telephone number levels with historical trending and projects future inventory based on average telephone number growth. You may also change the values for future utilization and pool blocks to see the immediate cause and effect on the month to exhaust point. Number Forecaster, along with all Port PS Solutions are accessed from the Neustar Numbering Services Portal. Query Manager: streamline reporting with pre-defined and stored queries. Define your variables and save, schedule and share your queries to speed reporting. RIMS: the Resource Inventory Management System (RIMS) interfaces with the Pooling Administration to simplify pool block requests, donations, modifications and returns. As a central repository for block utilization and forecasting, RIMS automates regulatory and forecast reports. API: as an alternative to the portal, you can integrate Port PS with your existing back-office to automate the retrieval of ownership and routing data. Number Analyzer: helps Code and Numbering Administrators respond to requests and questions regarding port-in and port-out activity and volumes; respond to utilization inquiries from Public Utility Commissions and helps reallocate numbers on the network.